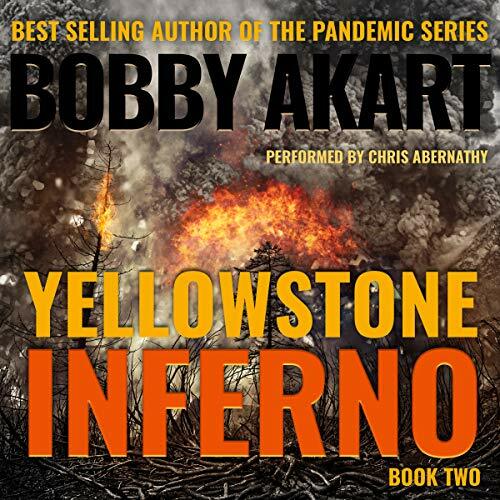 The Yellowstone series, a new disaster thriller from international best-selling author Bobby Akart, takes the listener on a thrill ride as a cataclysmic event of extinction level proportions ticks away like a time bomb, awaiting its moment. 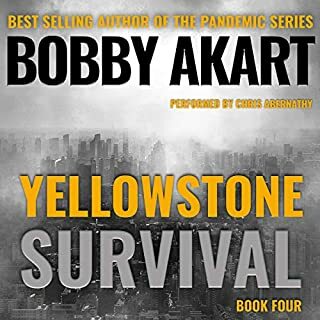 The Yellowstone Series, a new disaster thriller from international best-selling author Bobby Akart, takes the listener on a thrill ride as a cataclysmic event of extinction level proportions ticks away like a time bomb, awaiting its moment. 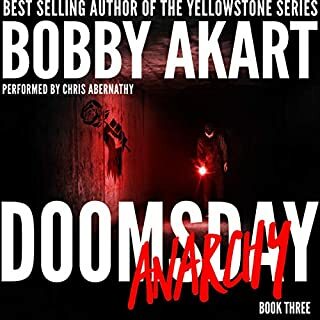 Millions of people visit the Yellowstone National Park every year blissfully unaware they are on top of the greatest killer man has ever known - the Yellowstone Supervolcano. Dark, powerful forces, willing to stop at nothing. A conspiracy deep-rooted throughout our institutions. A cyber attack. An EMP. Drone warfare. Americans caught in the crosshairs. Doomsday had begun. 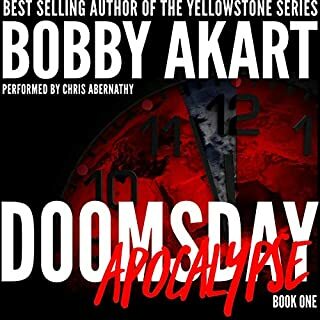 Author Bobby Akart once again masterfully tells a tale of a nation on the edge of societal collapse. For decades, Americans had found themselves increasingly at odds with one another - politically, socially, and culturally. Ten days after a massive cyber attack tears a hole in the nation's infrastructure and brings the country to its knees, Sam, Anna, Mason, and Amanda are preparing for the worst as the town of Breckenridge, Colorado is about to break. 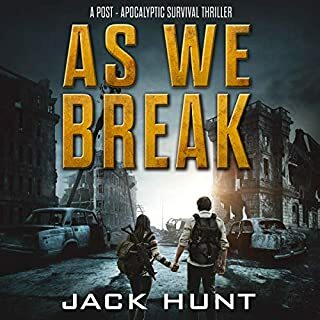 Haunted by his past, and determined to keep his daughter safe, Sam is forced to make some tough decisions and risk it all. A cyber attack was the beginning; a second attack is coming. The Republic of Texas has focused its efforts on the survival of its citizens to the detriment of those who seek to cross their borders. When an unforeseen enemy penetrates its defenses, the unthinkable happens, causing the nation to face its greatest test. Can Texas come together to protect its own? Will the death of one of its own cause turmoil among the ranks? Will the advancing Fifth Column receive assistance from an unlikely source? 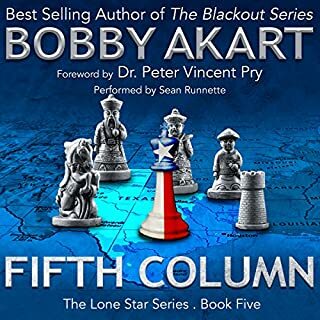 The Lone Star series continues with Fifth Column. 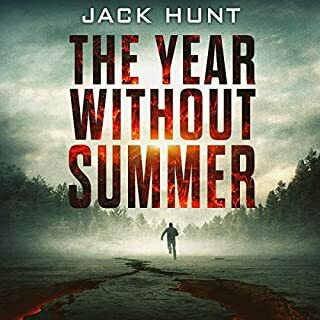 When recently divorced Catherine Shaw tries to reconnect with her young son Jordan by taking him on vacation in Yellowstone National Park, a series of disturbing events lead her to believe that the dormant supervolcano is on the brink of erupting. With the clocking ticking down and the aid of a damaged deputy park ranger, they will have to do more than convince the park superintendent of the imminent disaster. Thousands of blissfully unaware tourists have flocked to the serene park, trouble makers are on the loose, and not everyone wants to listen. 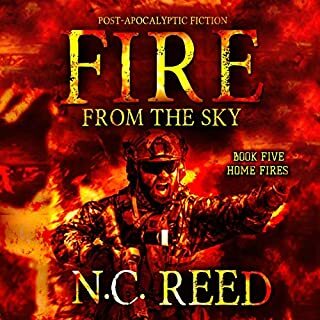 Major and Lucy Armstrong's four children are spread around the globe and are in a race against time to return to Texas before societal collapse takes America to the depths of human depravity. They use their ingenuity, grit, and faith to persevere but find themselves facing a most unexpected enemy. 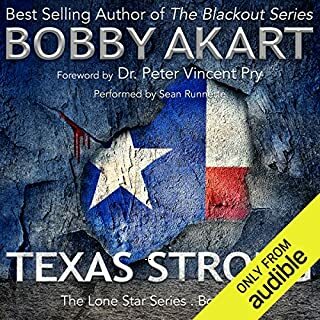 The Lone Star Series is a thought-provoking, gut-wrenching look into a postapocalyptic country devastated by nuclear destruction. America was on the brink of a second Civil War. Divisions were deep and fundamental. The heated rhetoric was abandoned in favor of weapons. The powder keg had erupted and nobody would be spared from the carnage. In Anarchy, the Doomsday series continues as the fuse has been lit and the battle has been taken to Main Street, USA. Sitting on the sidelines is no longer an option as Americans are pitted against Americans in a nation on the cusp of a Second Civil War. American political leaders failed to heed the warnings as two bullies of the world unite. North Korea and Iran - the Axis of Evil - bring the battle to American soil. Most of the country is without power, and the new president must decide whether to retaliate and risk escalation of hostilities or focus on recovery to minimize loss of life. Through careful, prudent planning and protection of their power grid, the state of Texas emerged relatively unscathed from the EMP attack. But what now? 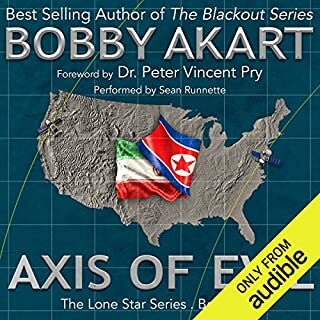 Best-selling author Bobby Akart once again masterfully tells a tale of a nation on the edge of societal collapse. For decades, Americans had found themselves increasingly at odds with one another - politically, socially, and culturally. 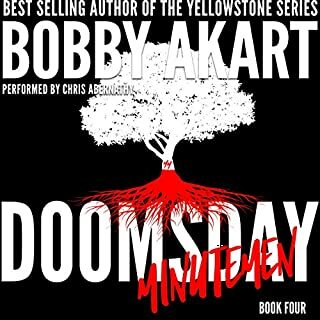 In Doomsday Minutemen, the Doomsday series concludes as the conspiracy reveals itself, and those responsible for leading the nation to the brink of a civil war are exposed. 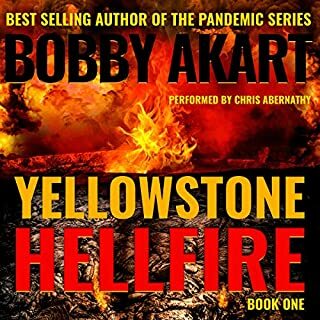 The Yellowstone Series, a new disaster thriller from critically acclaimed author, Bobby Akart, takes the listener on a thrill ride as a cataclysmic event of extinction level proportions ticks away like a time bomb, awaiting its moment. 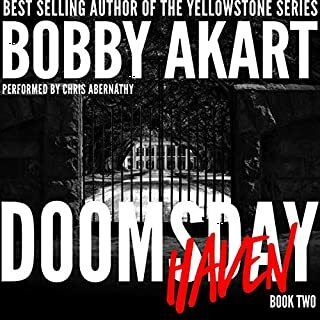 Millions of people visit the Yellowstone National Park every year blissfully unaware they are on top of the greatest killer man has ever known - the Yellowstone Supervolcano. Mankind had lived in the very shadows of the Earth's volcanoes for centuries. 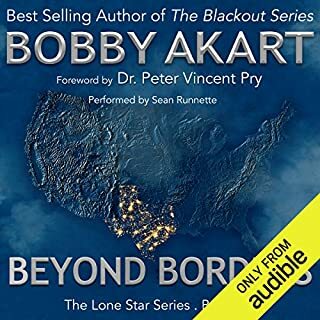 Through prudent planning, Texas protected its power grid from the impact of the devastating electromagnetic pulse attack, but was it enough? The new nation is but an island surrounded by chaos and devastation. Food is running out for its nearly 30 million citizens while millions of refugees press against the border fencing erected to keep them out. The pressure is on and an unexpected catalyst is about to create havoc for all Texans, including the Armstrong Ranch. We'll live to fight another day! With those words, a hero rose to the challenge and a family found the strength within themselves to face the unthinkable. The forces of evil have descended upon Armstrong Ranch. The family had worked this ranch since the 1800s and now invaders from a faraway land had plans to take it away. Will the Armstrongs persevere in the face of a well-trained, deadly enemy which intends to steal their home and end their lives? Terrorists kidnap and blackmail a young French scientist in Western Africa. 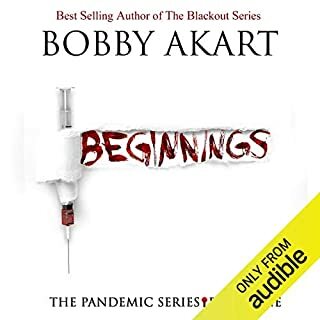 The outbreak of an ancient disease kills everyone in a village located in a remote jungle of Guatemala. US government operatives uncover a secret biological laboratory in Trinidad. An isolated death at the hands of this killer virus is discovered in Greece. Is there a connection, or are these simply a string of coincidences? Civilization exists by geologic consent, subject to change without notice. The land beneath Yellowstone's caldera is hot. Huffing and puffing. Moving, stretching, and bulging. Everything has a boiling point. Yellowstone has reached the point of no return. 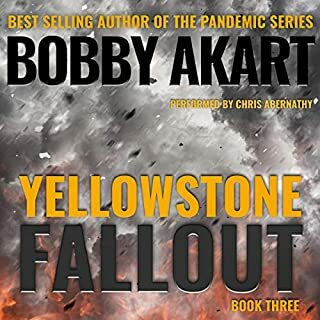 The Yellowstone Series, a new disaster thriller from critically acclaimed author Bobby Akart, takes the listener on a thrill ride as a cataclysmic event of extinction-level proportions ticks away like a time bomb, awaiting its moment. Millions of people visit the Yellowstone National Park every year, blissfully unaware they are on top of the greatest killer man has ever known - the Yellowstone supervolcano. Volcanoes are the Earth's way of letting off steam. Deep beneath the surface of the planet, excess heat builds up, and it seeks a way to vent. Like an overcrowded bus on a sweltering summer day, the overheated magma stews in its own madness, eventually allowing pent-up frustrations to boil over until it releases its fury - its Inferno - upon the world above. Yellowstone is not an ordinary volcano. It is an extraordinary killer that will show itself in due time. The eruption of the Yellowstone supervolcano will be more than a spectacle to grab our attention. It will be the end of the world as we know it. Volcanoes are the Earth's way of letting off steam. While most people look at volcanic eruptions as natural disasters, the fact of the matter is without them, the Earth would explode. Deep beneath the surface of the planet, excess heat builds up, finding a way to vent. Like an overcrowded bus on a hot summer day, the overheated magma stews in its own madness, allowing pent-up frustrations to boil over, until it releases its fury - its hellfire - upon the world above. Yellowstone is the most potentially explosive, violent, deadly, active volcano on our planet, and scientists agree, a catastrophic eruption is inevitable. Yellowstone is extraordinary in its potential and is quite simply Earth's greatest killer. You've been warned. ©2018 Bobby Akart Inc. (P)2018 Bobby Akart Inc. 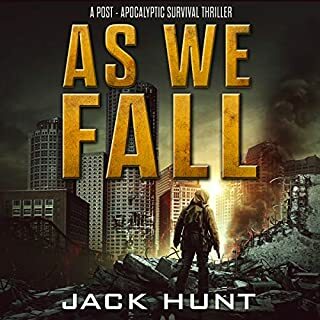 Extremely intense read!I have lived in a few of the areas mentioned in this series and have been in more than a few earthquakes due to the neatness to faultlines.You really capture the emotions that one experiences! A fantastic experience and an incredibly enlightening read!! So I am finally able to breathe once more after holding my breath throughout most of this book and the first book as well! The writing is wonderful and the message is not to be ignored. I have truly enjoyed the 1st 2 books of this series. it has been a great listen and you can actually learn some things as the story unfolds. Looking forward to the 3rd book. Character development fell appart in the second book, rendering the Doctor to a weak character. Author used the book as a political soap box, no issues, but detracted from the story. I loved everything about it...I can't wait to read part 2! I especially loved the narration. I really enjoyed the series. written differently less complicated than a lot of the author's books. one of only the few listened to/read entirely. When this happens we are all going to be screwed. Everyone needs to wake up and be ready. 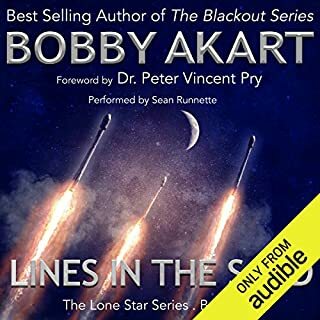 Great narrator, suspenseful story line, accurate information. This narrator correctly pronounced all of the Oregon towns, unlike most narrators. Book #3 here I come!! 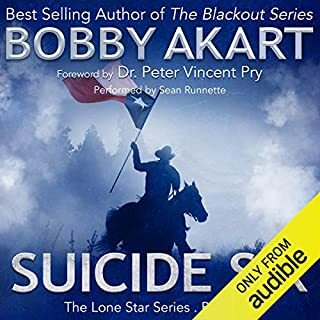 Great performance, action packed fun read. Cant put it down! Looking forward to the next book.